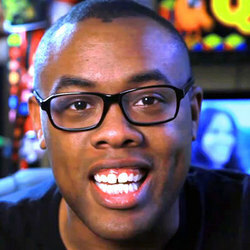 Andre Meadows is the creator and "Black Nerd" of the YouTube channel. Every week, he posts rants, interviews and vlogs filled with a passion for geek culture, comic conventions, 80's retro and 90's nostalgia. Andre has met former Power Rangers and Nickelodeon stars, sang Reading Rainbow with LeVar Burton, and even did the Ninja Rap for Vanilla Ice! He's an official ambassador for Nintendo, Teenage Mutant Ninja Turtles and Power Rangers, and has a huge collection of Smurfs, Gremlins and cartoon collectibles. Andre is not a Brony... he's a Care Bro!